It had already been a busy day, and in the dining room, we were enjoying a leisurely dinner, sitting over a glass of wine, enjoying a relaxed conversation with table mates and agreeing that we were tired out. We had been up early and watching from our window as we slowly approached Cierva Cove on that spectacular morning. After an early breakfast, we had piled into the zodiacs for a wonderful cruise through slushy sea ice with some larger bergy bits our zodiac driver did his best to avoid. Zodiac riding had shaped up to be one of our favourite things, in any weather. We spent about ninety minutes in the zodiacs on this occasion, then it was back on board, as usual greeted with a smile, a warm towel and a hot drink. I even stripped off a layer or two and enjoyed a sunbake on our balcony before the zodiacs were reloaded and we slowly made our way North, up the Antarctic Peninsula. After lunch, we had gone ashore at Mikkelsen Harbour and stayed ashore most of the afternoon. We had hoped to get into Mikkelsen Harbour a few days earlier, when we had been running South down the Peninsula, trying to avoid the worst of the bad weather. On that day, I was on the bridge as we hove to outside Mikkelsen Harbour while the Expedition Leader and the Captain peered through binoculars past the blowing spray to determine whether it was safe to enter. Unfortunately, at that time, there was a lot of sea ice clogging the entrance and it looked to be heavily iced inside as well, so we continued on South. But today, it was brilliantly sunny and the ice had moved elsewhere so we entered this sheltered anchorage. The water there is an incredible royal blue, and with the white mountains of Antarctica as a backdrop, the scenery was breathtaking. We had a great afternoon at Mikkelsen Harbour, watching the Gentoo Penguins on their never-ending task of carrying pebbles back and forth across the snow to their odoriferous nests on exposed rock and mud, photographing the few elephant seals that stayed sound asleep throughout our visit, and sliding down a snowy hillside on our backsides, like children at play. Nothing empties a restaurant faster than an announcement like that. Within 15 minutes, almost all of us were back in our waterproof pants, the ubiquitous rubber boots, hats, gloves, scarves, buffs, parkas, and life jackets, cameras at the ready, prepared to face the elements yet again. When our little company of four zodiacs had gathered, we cruised towards where we could see whales breaking the surface. When we were getting close to where the whales were feeding, we stopped and just sat in silence and soaked up the amazing atmosphere. It was a magical evening and we were awestruck. Even at 9.00pm there was a silver twilight, reflecting off a sea that was pure glass, and with a featureless pale grey sky above. Within minutes, the curious humpback whales surrounded us- some cruising under the zodiacs or surfacing right beside us. Three suddenly popped up in the middle of the zodiacs and treated us to a display of synchronized swimming, all three rising then diving in perfect unison. We sat there for perhaps an hour, the silence only broken by the periodic exhalations of the whales, the endless clicking of camera shutters and our own exclamations as they came startlingly close to us. In the distance, our ship also sat motionless on the glassed-out sea, and we commented on how pretty it looked, as the deck lights came on and were reflected in the sea. Whenever we were ashore, enjoying a zodiac ride or paddling a kayak, the Sea Spirit was a warm and reassuring sight. In this world of snow, ice, black rock and frigid water it was always there, waiting patiently for us to return home. We could have stayed for hours, watching the whales as they fed nearby, and some of our fellow travellers wanted to do just that. 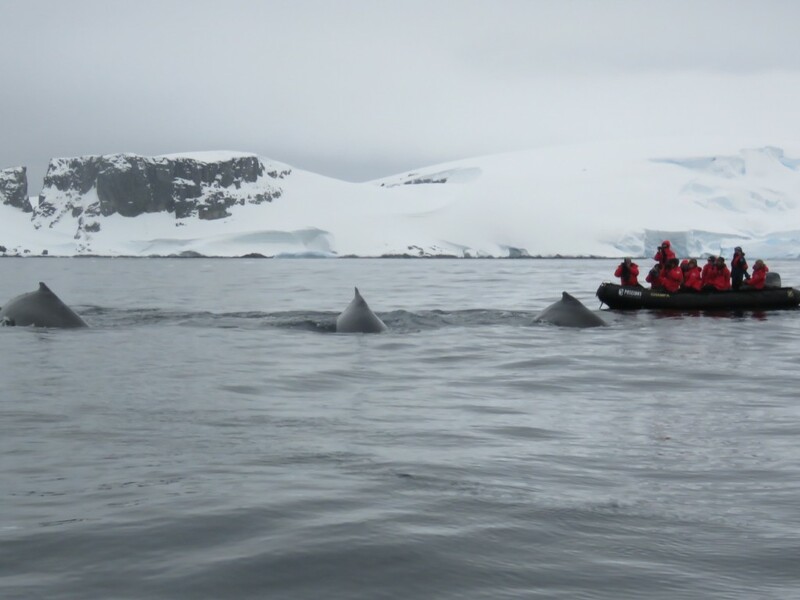 But the expedition team had something else they wanted to show us, so just as the first plump flakes of snow started drifting down, we slowly motored away from the whales and headed for the nearby Spert Islands. As we approached, the islands became more and more dramatic in appearance. Huge high cliffs of black basalt edged narrow channels running between the islands. No landing places at all; no form of land other than these towering black cliffs on either side of us that seemed almost to meet overhead. The colours were breathtaking- the black cliffs reflecting in deep turquoise water- but as we were about to enter the first channel, the surface beneath us was suddenly more white than blue and distinctly lumpy. The channels were full of sea ice. As the zodiacs make their way through this loose sea ice, it is a stop-start noisy business. The zodiacs push into the raft of icy bits and keep going until all forward motion ceases. Then, the zodiac goes astern into the clear patch of water just created and the raft of ice is charged once again. This pattern is repeated until the zodiac makes it through, or the prop gets completely fouled with ice and stalls. Then, the outboard is lifted out of the water, and the driver pushes the ice clear with a paddle. If all else fails, the paddle is used to strike the attached ice until it gives up and falls off the prop. These zodiacs are amazingly strong and their drivers remarkably skilled. As the first zodiac to enter the channel, we had to create a path of clear water for those that followed. The experience of pushing a path through that gloomy ice-filled channel, with snowflakes floating down on our heads, is an experience like no other in life- one never to be forgotten. The final breathtaking experience of that long day came after all of our zodiacs had made it through the channels. 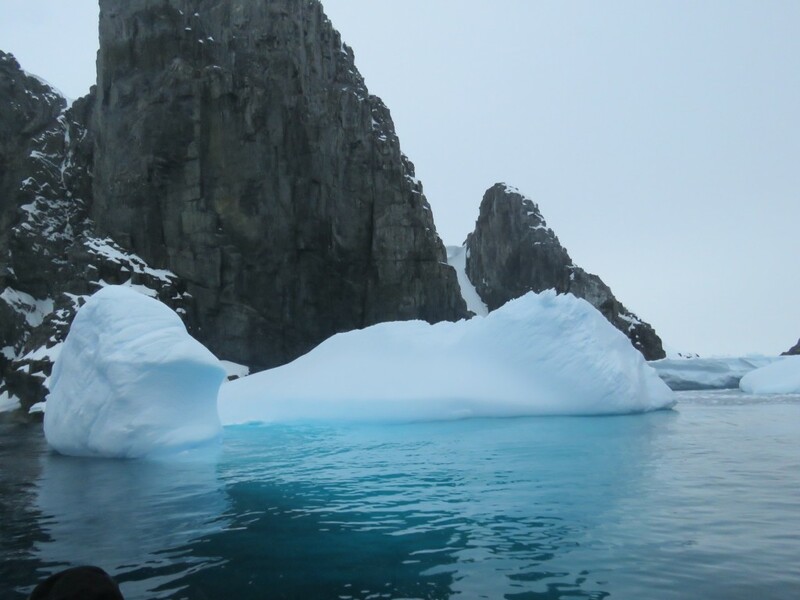 Across the bay, the zodiac driver noted a large cave at sea level, so we scooted across to it, only to find it was so full of ice, it was impossible to enter. But the zodiac driver knew it was more tunnel than cave. It went right through the headland and out the other side. 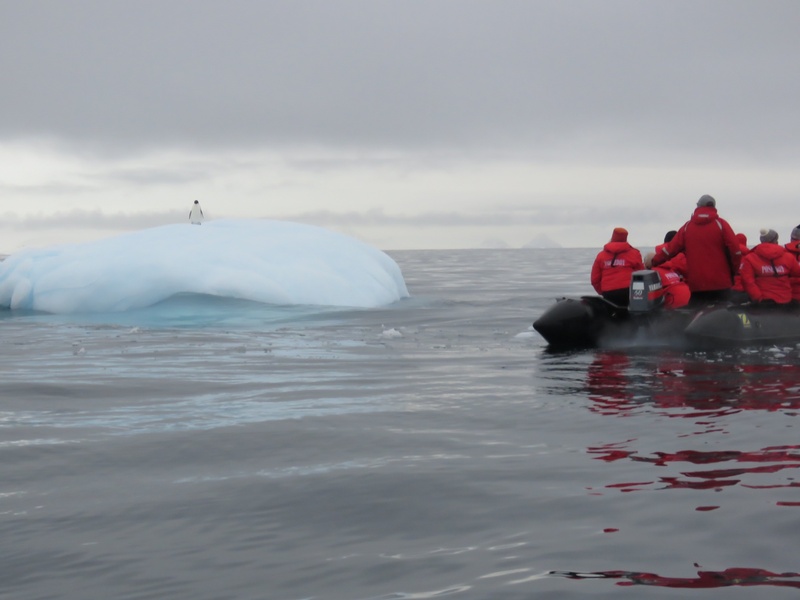 So the zodiacs again picked up speed and cruised around to the other side of the headland, where we were able to enter the cave… very carefully, since an iceberg was rising and falling on the swell, and almost blocking the entrance. The driver had to judge the timing precisely, to sweep past the iceberg as it swayed away from the cliff face. As only one zodiac at a time could fit inside the cave, we sat offshore and rocked gently in the swell, waiting for the others to emerge before we headed back to the ship. By then, it was almost midnight, but the silver twilight continued, with dawn only an hour or two away. For many of us, this evening zodiac trip was the highlight of what had been a trip of a lifetime. Would you like to experience a zodiac ride yourself? 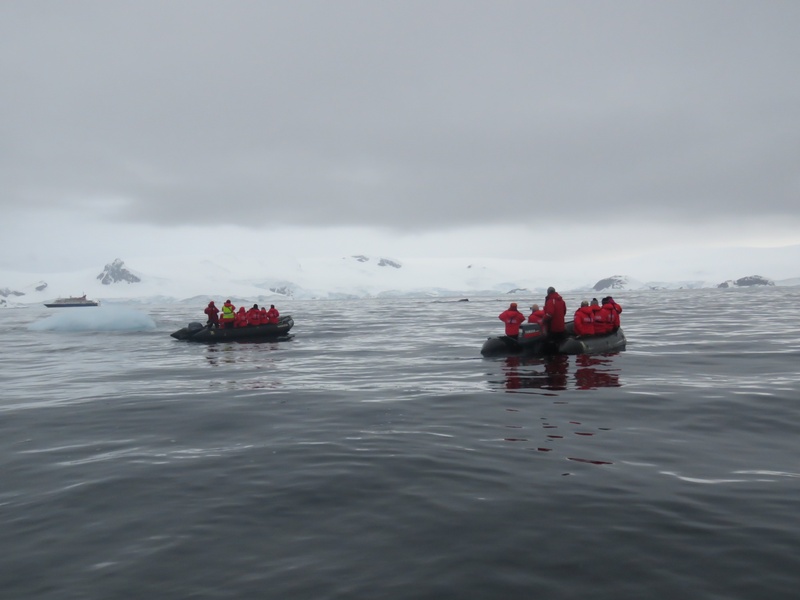 Get more information or plan a trip to Antarctica by clicking here.